In this series of posts, we explore how EPA has designed the Clean Power Plan to facilitate the buying and selling of credits representing emissions reductions at fossil-fuel fired power plants. Part 1 focuses on rate-based trading. Part 2 explores how states can trade allowances representing tons of CO2 emissions. Note: This post represents Synapse’s current interpretation of the Clean Power Plan, which is subject to change based on clarifications or new documents released by EPA. EPA allows states that have chosen a mass-based compliance approach to establish mass-based trading programs. In fact, EPA has established such a trading program as one of the proposed model rules for compliance with the Clean Power Plan. Participation in a mass-based trading program is also included as an option for compliance within the federal plan that states will have to meet if they fail to submit adequate compliance plans of their own. Under EPA’s proposed model rule, states that choose to comply with the Clean Power Plan on a mass (tons of CO2) basis will be able to trade allowances, which represent one short ton of CO2 reduction. The number of allowances made available each year under a mass-based trading program must equal the state’s aggregate emission limit, which is set by EPA, and every generator subject to the Clean Power Plan must surrender allowances equal to the quantity of CO2 it emits during the compliance period. One key advantage to mass-based trading is that, unlike in rate-based approaches, all units in all mass-based states are able to trade allowances with one another as long as they prove to EPA they are effectively compatible. The figure below illustrates the potential trading interactions across states and compliance pathways. In this diagram, units in each single state (represented by “AA,” “BB,” etc.) may trade ERCs or allowances within each solid circle, representing trading between units in the same state. 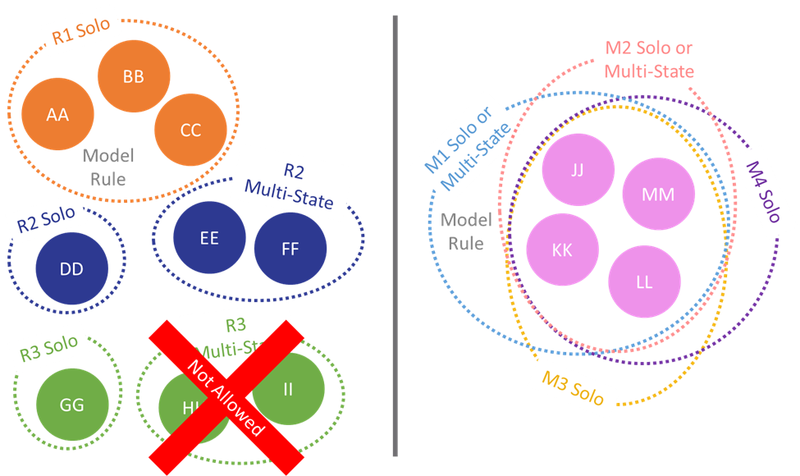 In the rate-based universe (shown on the left), units can only trade with units in other states that are taking the same approach, or are working together to meet an agreed-upon approach, represented in this diagram by the dotted circles. Many existing mass-based trading programs, including the Regional Greenhouse Gas Initiative in the Northeast, use an auction process to distribute allowances. Auctions have many potential benefits, including incentivizing early action, avoiding indirect subsidies for operation of uneconomic resources, and decreasing policy costs through revenue recycling. Provide a demonstration that leakage is unlikely due to unique state characteristics or plan design meant to address leakage. Under the proposed model rule and federal plan, EPA proposes to freely allocate allowances to existing sources based on historical generation minus certain set-asides (explained below), which the agency believes will help mitigate emissions leakage to new sources. The total number of allowances that are distributed—the emission budget—would be equal to a state’s mass-based goal. Before historical generation allowances are distributed, three types of set-asides are calculated. The first sets aside a portion of allowances in each state from the first compliance period only for the proposed Clean Energy Incentive Program. The second sets aside a portion of allowances in each compliance period except for the first period for covered units based on an “updating output-based” approach. The third would set aside 5 percent of allowances in each state, in all compliance periods, for renewable energy projects. We describe each of these in further detail below. EPA established the Clean Energy Incentive Program to encourage and reward early development and installation of renewable energy and low-income demand-side energy efficiency. EPA proposes to set aside from the emission budget for the first compliance period up to 300 million CO2 allowances for use as matching early action allowances under the CEIP. A portion of these set-asides would be reserved for wind and solar projects and a portion for low-income energy efficiency. Any CEIP allowances that are not awarded will be redistributed to the participating states either on the same pro-rata basis described above, or they will be deposited into a federal pool where they will be available to qualified projects on a first-come, first-served basis. Any CEIP allowances that have not been awarded by the end of 2022 will be retired. Early action allowances can be banked for future use and traded freely among states with compatible trading programs. EPA proposes to set aside a limited portion of allowances to existing NGCC units based on their increase in the level of generation compared to the previous compliance period. EPA claims that the purpose of this set-aside is to align the incentives for existing units covered by the Clean Power Plan with new units that are not subject to the mass-based limits of the state plan. This, EPA says, will help to avoid emissions leakage to new units and to encourage the increased generation at existing NGCC units that is built into the targets under Building Block 2. Under EPA’s model rule and proposed federal plan, NGCC units subject to the Clean Power Plan that exceed a 50 percent capacity factor on a net basis over the compliance period will receive allocations from this output-based set-aside for the portion of their generation that is above 50 percent. (In the final rule, NGCC capacity factors are determined using net summer capacity, not nameplate capacity.) Each NGCC will be assessed based on its performance from the previous compliance period (e.g., for the 2025-2027 compliance period, the average capacity factor over the 2022-2024 compliance period is used). Any MWh generated at or above a 50 percent capacity factor over this entire multi-year period becomes eligible generation. The number of available output-based allowances is calculated by multiplying the total eligible generation at an NGCC unit during the previous compliance period by the new source performance rate for NGCCs (1,030 lbs per MWh). EPA has capped the size of the output-based set-aside at the number of allowances that each state would be eligible for if all existing NGCC units were to increase generation to a 60 percent capacity factor compared to their 2012 baseline. This cap is calculated once and is held constant throughout all compliance periods, which means as the mass goals decrease over the compliance period, the output-based set-asides will make up an increasingly larger share of available allowances. If, due to the cap, there is a shortage of allowances available to eligible NGCCs, the allowances will be distributed to each NGCC on a pro-rata basis. Any leftover allowances will be returned to the historical generation pool and distributed to all covered sources. Renewable energy generators that are eligible to produce ERCs (i.e., on-shore wind, solar, geothermal, tidal, or hydro units built on or after January 1, 2013) are eligible to receive allowances from the renewable energy set-aside. EPA proposes to set aside 5 percent of a state’s allowance pool in an account from which developers of qualified renewable projects could apply to receive allowances based on the projected generation from their projects. These allowances are allocated prior to each compliance period. The renewable project must be located in the mass-based state for which the set-aside has been designated and would not be eligible to produce ERCs in a rate-based state even if the project were electrically connected to the rate-based state. Allowances are distributed according to a pro-rata share of the projected MWh of each approved renewable generator. If fewer allowances are sought than are available, an approved generator would get the full number of allowances requested. After each year, renewable generators must submit their actual generation data to EPA. If a generator did not achieve the projected generation, the unfulfilled MWh are subtracted from the available set-asides for the next generation year. Other harsher penalties exist for renewable generators that consistently over-predict their generation. EPA believes this set-aside encourages early deployment of renewable energy projects by lowering the marginal cost of production of these resources within a state. EPA also believes that this set-aside will help minimize leakage by making renewable energy more competitive with new sources. Moreover, the total number of allowances in the renewable energy set-aside pool will actually grow over time as the allowances allocated to retiring units must ultimately be deposited into this pool (as explained below). After set-asides have been calculated, EPA proposes to allocate the remaining allowances in the state’s emission budget to existing sources based on their performance over the 2010-2012 period. First, the average annual generation during this period for each unit is determined. If a unit did not generate in one or more of these years, that year is thrown out of the average (i.e., only non-zero values are considered). If a unit was under construction during this period (or did not yet exist), the average generation is calculated using the capacity factors used by EPA in target setting. Finally, a pro-rata factor is calculated for each unit by dividing that unit’s historical generation by the total historical generation from all the units in that state. Each unit’s pro-rata factor is used to determine the quantity of remaining allowances distributed to each unit in the state in compliance years. Allowances are distributed to affected units in the December prior to the beginning of each of the three interim step compliance periods (2022-2024, 2025-2027, 2028-2029), before the final compliance period (2030-2031), and prior to each of the two-year maintenance periods following the final compliance period. For example, in December 2021, allowances will be distributed for the entire three-year (2022-2024) interim step one compliance period. The total number of allowances distributed in this method is equal to the two- or three-year total less any set-aside allowances. What happens if a unit retires? If a unit retires or undergoes significant modifications to the point that it is no longer considered an existing unit covered by the Clean Power Plan, it will still receive allowances for a limited time. Based on the timing of the retirement (within the calendar year and the compliance period), retired units may receive allowances for up to four years post-retirement. EPA sees this approach as a reasonable compromise between indirectly incentivizing otherwise uneconomic units to keep operating by taking away allowances immediately upon retirement and giving away allowances to units that are no longer emitting. After this limited period, allowances that would otherwise be allocated to retired units are instead added to the renewable energy set-aside allowance pool. What happens if a unit emits more CO2 than the allowances it holds? In addition to being subject to civil penalties under the Clean Air Act, non-compliant units must forgo two allowances in a future compliance period for every one allowance not surrendered in the prior period. Deducted allowances are held by the EPA and are not re-allocated to other generators. States that work together, either through the development of a joint plan or by “linking” with other mass-based states as described above, can establish interstate mass-based trading programs. An allowance distributed in one of these states could be used for compliance by a generator in any of the other states. EPA believes that the larger the mass-based trading region, the more effective and affordable compliance will be. Therefore, under the final Clean Power Plan, units in mass-based states can use allowances obtained from other mass-based states for compliance as long as the allowances are properly tracked and the states are “linked” in some way. This linkage could be accomplished by using one of EPA’s “ready-for-interstate-trading” plans or by separately identifying bilateral or multilateral links with other states in their state plans. If these conditions are met, a state can link with the federal trading program and units in that state can use allowances from any other state that is under the federal plan or similarly linked to it.